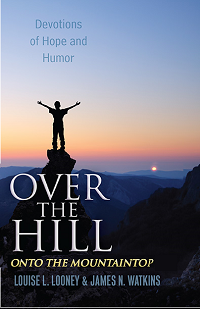 Louise L. Looney and James N. Watkins refuse to believe they are “over the hill” and are continuing to climb higher and higher. Join them in a journey of hope and humor. The award-winning author and speaker wears more hats than his Aunt Luella: author of seventeen books, speaker across the U.S. and overseas, editor, and most important, “Papaw” to five adorable grandchildren. His writing and “Hope & Humor” cartoons can be found at http://www.jameswatkins.com.